LAVACA (KFSM) - Most fans don't think of the number of players affecting the excitement level of a football program but when player participation is low, it weighs on the team. But when the numbers are higher, and in Lavaca's case much higher, then the excitement level sky rockets. "You know we fought the numbers game the last couple years and I think we went to the playoffs with 18 kids healthy last year and to have 36 show up healthy and ready to go for fall camp, it's been great," Lavaca coach Brian Schlinker said. With the higher numbers comes a little bit of a challenge for the team, but it's one the Arrows will gladly deal with. "We've really been out here working hard," Lavaca senior Trevon Moore said. "As you could see we had some kids with purple and yellow helmets instead of our matte purple face mask and stuff like that, that's because we got 36 kids out here and we only had about 34 helmets so we had to go order more so that's great to have. It honestly is." Lavaca is moving to the spread offense this season and with it comes new faces at new places. Seniors Jimmy Hall and Tyler Armistead are battling it out for the quarterback position but Armistead looks to be a better fit at running back despite leading the team's offense a season ago. "The kids all love the spread offense," Schlinker said. "We're still going to be run based obviously. We brought in coach Graves and he's really experience with the power spread look and we're excited about it." 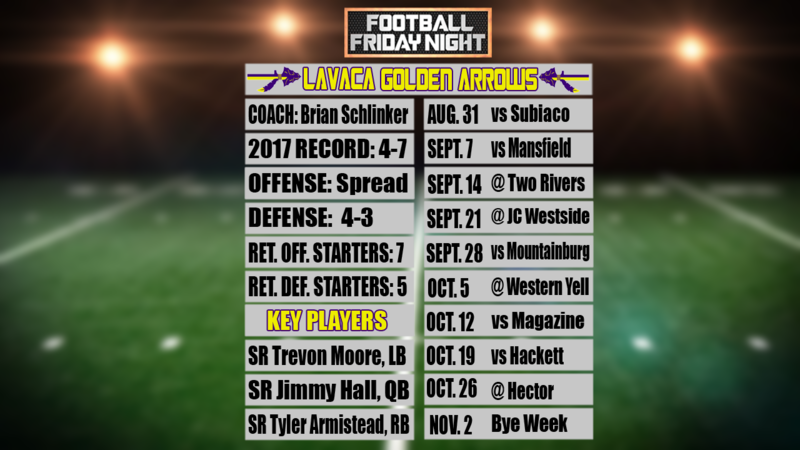 Lavaca opens the season on Aug. 31 as they host Subiaco Academy.